Inspired by all the great New Orleans music from the 1960's through today, this album was written with deep grooves and lyrical hooks in mind. 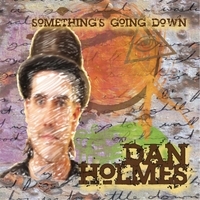 Fans of Dan Holmes instantly know his unmistakable songwriting and piano playing style. His original music is a little bit of New Orleans mixed with some piano funk rock as told by a singer/songwriter. His style of piano playing conjures up memories for his audience of players such as Jerry Lee Lewis, Dr. John, and Pinetop Perkins, while his storytelling in his songs has been compared to the Beatles and Randy Newman. Dan is always performing somewhere. Sometimes as a solo piano/vocal act, and sometimes with a piano-guitar-drum-bass set up, his act always puts on a show all ages can enjoy. On an average night, he will mix in with his original material some old soul tunes or jazz standards, maybe some forgotten rock tune, and definitely a bunch of piano boogie. He is very interactive with his audience, and prides himself on being a very energetic act. Dan Holmes has been performing professionally since 1993. Playing every chance he could, his talents have sent him to perform regularly all over the country, including Los Angeles, New Orleans, Austin, Chicago, Indianapolis, and hundreds of other places. He has been heard on a wide variety of radio programs, including the nationally syndicated Bob & Tom show and National Public Radio. "Something's Going Down" marks his ninth release of albums of his original material, and he appears on countless other artist's albums. Even his debut release in 1998, "PURE", was greeted with high praise, with reviews placing it in the top ten best albums of the year, calling it "truly original", and giving it 4-1/2 out of 5 stars. Dan is always on tour performing over 200 dates per year, and never stops writing new material for his future albums.